Home » Just Thinking » Is Relating With Your Child a Priority? If 4 year old little Bezus always looks preened to perfection, but pays no attention when you say NO, are you really accomplishing what you most hoped as a mother? If the VBS club you volunteered for this summer came off beautifully, but you don’t know the greatest concern that was kicking around in the head of your elementary student, have you invested your time toward the most satisfying end? If those in the church and local community respect you highly, but you and your teen really don’t connect deeply, have you succeeded at your ultimate goal? As mothers, there is so much around us vying for our time and energy. 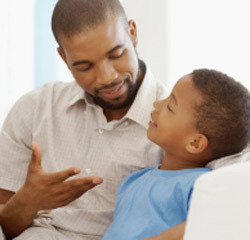 I challenge you to prioritize training your young children, develop deep communication in those elementary school years and continue to delve deeper with your teen. Training young children takes a lot of time, energy and some know how. As for time, take time to be alone, set goals and assess where you are at in working toward those goals. Energy is an important consideration as well. Don’t fall into the trap of being overly busy! Our culture seems to respect those who run themselves ragged while Jesus Christ took time to relate. So remember, one person can only do so much, and still do it well. Decide for yourself what you will focus on succeeding at. Know-how is easier than ever. Find an older mother who you respect, ask to meet for lunch. Don’t be afraid to reach out and ask for insight. There are also many great authors whose books have been extremely helpful to me and many other mothers. No matter what age your kids are, it’s never too late to begin making relating with them a priority. Don’t be discouraged or controlled by the past. No one gets it perfectly. Never quit working to improve the parts of your life that mean the most. You have heard it before but I will say it again, you don’t get these developmental years back, so dive in for all your worthwhile the time is at hand.